1/4/01 – Sean and I had a game of soccer with Mark and Ross and their young visitor, Gavin O’Brien. It was a very good game, with a lot of running around, and I was soaked in sweat afterwards. Sean loved it. 2/4/01 – I cooked Sean’s dinner and had a game of chess with him. 4/4/01 – Sean was tired and emotional, crying about Grandad – he came down and sat on Pauline’s knee for a while. 5/4/01 – Pauline collected Sean from school and took him to a dental appointment in Ballyjamesduff – his teeth are fine. [Later …] Played chess with Sean. 7/4/01 – Pauline and the kids got back having had Sean’s CR-Rom drive replaced in PC World, and bought the full version of Cossacks (for his birthday) … we installed Cossacks on Sean’s computer but couldn’t get it to work – it worked on mine OK.
9/4/01 – In HMV I bought The Well Below the Valley for Sean out of his own money … [Later] I played draughts with Sean and we listened to The Well Below the Valley. 11/4/01 – Pauline took the kids to her ‘Storylines’ workshop, which went very well again. Sean and Susanna are loving it. 13/4/01 – Sean and I discussed Hannibal, Carthage and the Punic Wars, a subject that’s close to his heart at the moment. Nora rang and said that a calf was about to be born; she collected the kids and they spent the next few hours helping at the farm and having lunch there – Sean regaled all present with his tales of Hannibal … Sean and Susanna went back to the farm to help with the milking and were there for three hours or so – they had a really great day. In between, Sean had actually chopped some firewood. 14/4/01 – Sean did some more wood-chopping – he’s in great form these days. 17/4/01 – I played pool and chess with Sean. 18/4/01 – I looked up stuff on Hannibal on the Internet for Sean. 19/4/01 – Sean and I watched Liverpool beat Barcelona in the UEFA Cup semifinal – apparently Dave was at the match. 20/4/01 – I got the guitar down from the attic and played a bit for the kids … Pauline, with some help from the kids, spent much of the day tidying the house. She also took them to join the library in Cavan, and all three borrowed some books … [Later] They were home quite late – the kids had had a wonderful time [at the farm]. 22/4/01 – Sean and I saw two foxes in a field to the back of the house. 23/4/01 – I played chess with Sean. 24/4/01 – I played chess with Sean. 27/4/01 – The kids had a great time at the farm, helping with the milking and so on. 28/4/01 – Martin was here playing with Sean for six or seven hours. 30/4/01 – In the afternoon I noticed that Fluffy had caught a field mouse near the front of the house. In its efforts to run away, it actually made a stand – at one point it stood on its hind legs and tried to intimidate Fluffy. I went out and brought Fluffy in – the mouse stayed in one place for quite a long time, and I was able to show it to Pauline and the kids, plus Romy and Tadhg. Then it ran off, apparently none the worse … [Later] I played chess with Sean. 1/5/01 – The kids went to the farm, where they had a great time, helping out. 3/5/01 – Pauline took Sean to Oldcastle and they borrowed the Lake Placid video, which we watched – it was awful, but Sean liked it. 5/5/01 – Sean worked out how to use the remote properly, so we had numerous channels for the rest of our stay [in Portstewart]. It was a beautiful day – we went to the beach quite early and stayed there for a few hours. The kids played in the sand and the water; Pauline and I played games with them and read the paper. Then we went to the playground by the promenade, and the kids went on racing cars and so on. Then we went to Morelli’s – we all had pizza, and the kids had a hot fudge sundae each. 9/5/01 – Sean and Romy went for a cycle – they seem to be getting quite pally. 11/5/01 – Sean was home late – they had finished fifth in the Credit Union quiz (in Navan) out of a large number of teams, so they did very well. 13/5/01 – Sean sang in the choir for the First Holy Communion. 15/5/01 – Martin’s mum dropped him off for a couple of hours to play with Sean. 18/5/01 – Pauline brought Martin here after school – he was going to have a sleepover. [Later] Martin and Sean were awake late, of course. 19/5/01 – Sean and Martin were up at 7.30, and played outside for most of the morning. 22/5/01 – Sean, Susanna, Romy, AJ and Andy went up the fields to the ‘sheep’s graveyard’, and I went after them – beautiful. 23/5/01 – Pauline took Sean, Romy and Susanna to their ‘Storylines’ performance … I went with Mark and Tadhg to the Ramor Theatre. The show went very well – the kids performed their made-up sketches in groups. 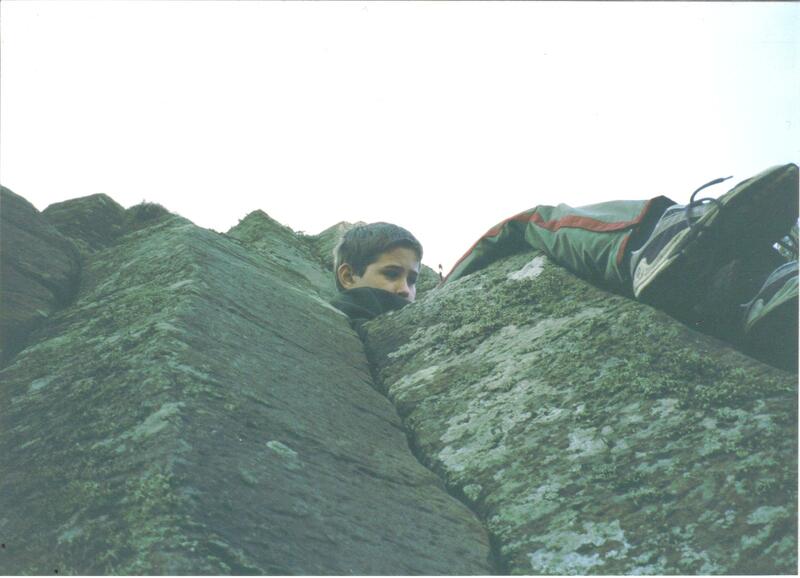 25/5/01 – Sean had to be at the school at 8.30 for his school tour – they’re going to Mellifont Abbey (I think), the ecology centre at Laytown and somewhere else that I can’t remember … Sean went to Martin’s house after he got back from the tour … [Later] Sean stayed up for the Late Late Show because Christy Moore was going to be on it, and Susanna stayed up for part of it. Christy played with Donal Lunny and Declan Sinnott, and was in great form – as sharp and funny as ever. 26/5/01 – I had a cycle with Sean later … The kids went to the farm. They had a great time. 27/5/01 – Romy played with Sean and Susanna, as she generally does … It seems that Romy was mean to Susanna – this is possibly related to the fact that Sean and Romy are now ‘boyfriend and girlfriend’! 31/5/01 – Martin was here to play after school. The kids went to the farm later. Great picture Brendan, I can see where Sean got his camera skills. Seems an age since I commented on your blog. Do you still keep detailed diaries? Yes, he definitely got those skills from his mother. 🙂 I kept detailed diaries from 1984 up to summer 2004, when I left one behind me while on holiday in Majorca, and couldn’t be bothered to start again. It’s certainly interesting to look back on them … so much that I had forgotten about. The new boy is settling well. He’s much quieter and gentler than Cat, but it’s still early days. Yes, I think you mentioned that before. We have something similar near us … they had to open a charity shop to fund it recently. Yes, I agree with Isobel, that is a very good photographic angle, making a good photo great. I did not know much about the Giant’s Causeway, but now I do. What a fascinating place. Hi Shermeen … Samuel Johnson famously described it as ‘worth seeing, but not worth going to see’. I think it’s worth going to see, though. You know Brendan, had this photo been taken with a modern camera, the high res. or whatever they call it, quality would have truly brought out the distinctive features. However, it remains an excellent photograph both in composition and indeed in symbolism. The latter with the benefit of hindsight, of course. Yes, Shermeen … just a snapshot that I scanned, with loss of quality, but Pauline, like Sean, always had a good eye for a photo.